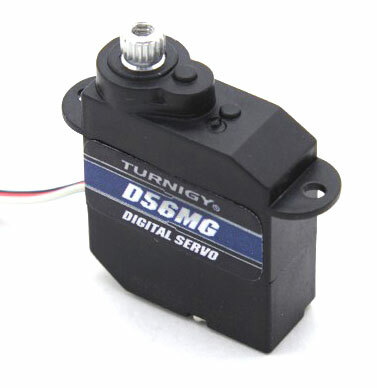 The Turnigy D56MG is a HV or high voltage coreless servo great for the FireFly due to its low weight of 5.6 grams. This coreless servo motor has excellent holding power and precision but one thing that lacks is the centering. Although it does center pretty well, at times it will skip a single tooth which does not make a big difference in flight, but those who are antsy about precision centering would not be thrilled. The screw is also difficult to screw in the servo arm. Besides these minor flaws, these are great little power house servos. The HV voltage lets you use a 2s Lipo directly with no need for a BEC which will provide a whopping 1.2kg/cm of torque.